We are Kodi’s Krew. We are friends and family of Kodi Brown. Kodi Brown is a 10 year old girl from Killinchy, Co. Down. 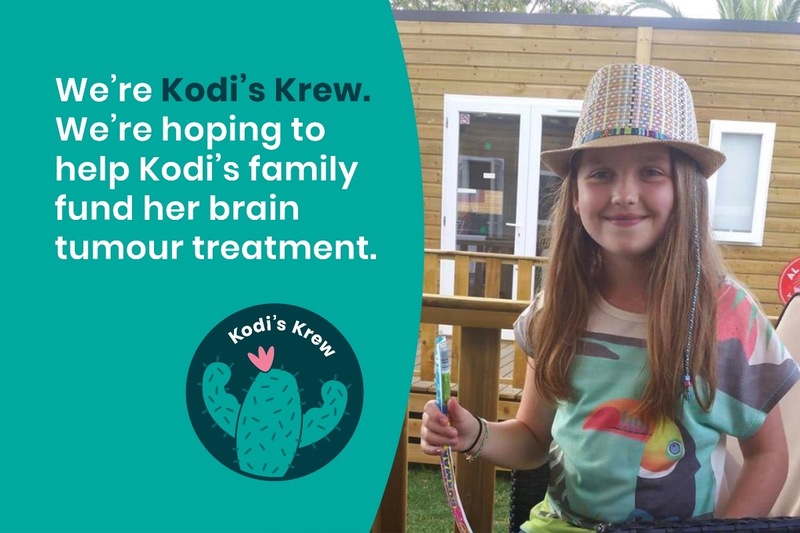 Kodi was a normal, healthy girl who loved animals, shopping, holidaying, sport, baking (and growing cacti’) until she fell ill on 20th February this year, while playing at her friends house. She was taken by ambulance to our local hospital were she remained whilst tests were conducted. Kodi was initially diagnosed with a viral infection and given antibiotics, antivirals and anti-seizure medication. After a 3 week stay in hospital Kodi was allowed to return home to recover. However, she continued to have seizures. The medication kept them at bay to a certain extent. A long recovery time was predicted but her family were optimistic that she was getting stronger and were hoping to send her back to school for the last month of P6. In May, at a routine MRI scan where her family expected to get the all clear, they received the news that no family should have to hear. The swelling was still there. Kodi was put on steroids and a biopsy was scheduled. Kodi was readmitted to the hospital on the 18th May. 4 weeks later the worst was confirmed. Kodi had a brain tumour. Curative treatment was not offered in the UK on the NHS. Kodi’s family refused to accept that there were no other options. The family researched other methods unsupported in the UK and found a clinic in Germany who offered them hope. They set off on a self funded trip to Germany to a clinic where pioneering immunotherapy is offered, alongside infusion treatments to strengthen the immune system in conjunction with conventional brain tumour treatments. Kodi and her family have been in Germany for 2 weeks now and are self funding the treatment. Each week of treatment is costing €6,000, each MRI scan is €950 and this week Kodi had an IV port fitted at the cost of €2,500. The treatment is expected to last for 6 months, during which time Kodi hopefully will be able to return home for short periods of respite. Kodi’s mum has been allowed to stay in the clinic to care for her during her treatment, but her father, little brother and grandparents are funding their own private accommodation in the nearest village. Kodi’s family have moved mountains to secure the best possible treatment for her condition. We would like to do everything that we can to help to alleviate any financial worries so that their focus can go towards their very precious Kodi. The money we raise will go towards helping Kodi's family fund her treatment in Germany. We would like to ask you to help us to raise money to lighten the financial burden. It can sometimes sound like a cliche to say that every penny counts, but in this situation I am sure that everyone understands that in Kodi’s world this is saying has never been more true. Please join Kodi’s Krew by liking and sharing this page, and donating- lets see what we can achieve for a very special girl and her family. Kodi's Krew are friends and family of Kodi Brown, from Killinchy Co. Down. The money we raise will go towards helping Kodi's family fund her treatment in Germany. We have reached the £100,000 mark!! 5th December, Wednesday- Christmas film fundraiser organised by John Minnis Estate Agents Showing Elf at Tudor Cinema, Comber. Tickets £10, including popcorn & prosecco. 8th December, Saturday- Kildare shopping trip! Pickup Comber Sq 7:45am & McCanns Killinchy at 8am, leaving Kildare 6pm. Seats £20 with discount voucher included Contact us for last few remaining seats! 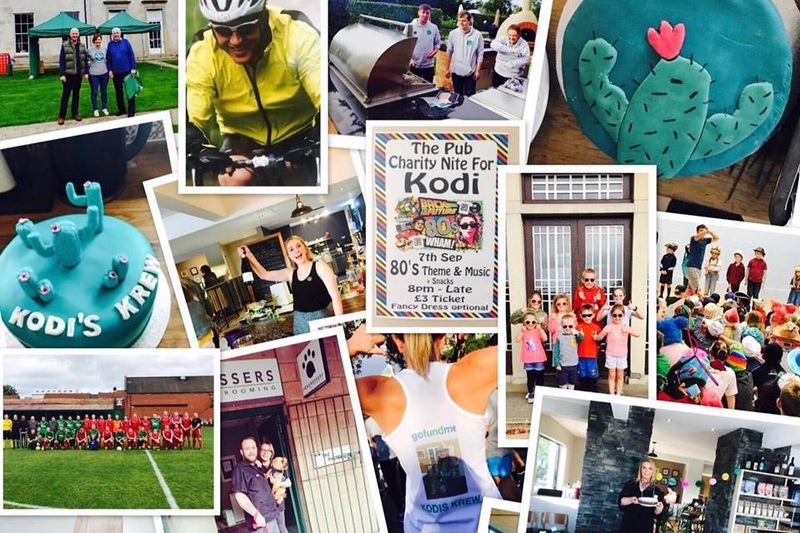 We have raised over £75,000 for Kodi in just over 2 months ❤️ halfway to our fundraising target so THANK YOU to everyone who has donated so far! We've reached 1/3 of the target in just over a month, so let's keep it up and see what we can achieve for Kodi What lovely people you all are!